One of the reasons for the popularity of almond milk in the Middle Ages was its high protein content, and its ability to keep better than milk from dairy sources. If cow, sheep, or goat milk wasn't prepared quickly to make cheese or butter, it soon soured. Almond milk, conversely, could be made as needed, in the quantities needed. Further, dry almonds were easy to store and did not require the cold temperatures for storing fresh milk. Almond milk is indisputably nutritious with little to no saturated fat, unlike cow's milk, and no lactose, which many find indigestible. Some doctors suggest, however, that almond milk should not be given to children transitioning from formulas, as early introduction of nuts to a child's diet may predispose the child to severe nut allergies. Obviously, anyone with a peanut allergy should verify no almond allergy exists prior to using the product. One can find commercially made almond milk in natural food stores. It does not yet have the popularity of soy or rice milk, so it is a little harder to find. It makes an excellent substitution for milk products in many recipes. However, recipes that require a high fat content milk or half-and-half may not produce the same results with almond milk. Almond milk lends itself particularly well to recipes for pancakes, for blancmange and is also excellent in smoothies. In this world of substitutes, food products can be easily replaced for one another. 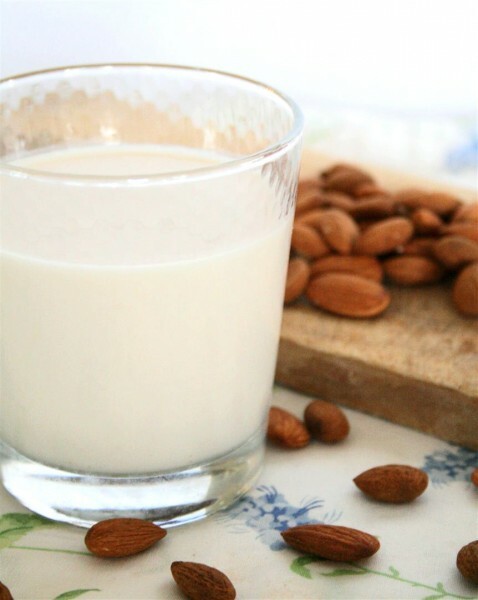 We've heard about soy milk being used as an alternative to cow's milk, however, what about almond milk? Almond milk like soy milk is not milk in the literal sense. It is a drink made from ground almonds and water. Almonds soaked for 6-8 hours in water are drained and blended with water until a milk-like consistency is obtained. The skin and granules are removed by straining. Blending a few dates along with the almonds gives it a sweet taste. Almond milk nutrition facts as well as its health benefits make it a suitable replacement for cow's milk. Almond milk can be prepared at home and is also available at supermarkets. Almond milk is being basically used instead of cow's milk by people who are not too fond of cow's milk, as it tastes better than cow's milk. Children who fuss about drinking cow's milk can be given almond milk. They prefer almond milk's taste as compared to soy or rice milk. This non-dairy alternative is also used by those who show lactose intolerance symptoms. Since almond milk is extracted from almonds, it is lactose-free and can be easily consumed by lactose intolerant people. 8 fl. oz. or one serving of unsweetened almond milk contains about 30-40 calories, 2.5-3 g of fat, 1 g of protein, 1 g of fiber and some vitamins and minerals. Let us have a deeper look at how these nutrients are beneficial to our bodies. The calorie content of almond milk is lesser (half) than cow's milk or soy milk. Thus, people desiring to lose weight can happily lap up almond milk. Almond milk is a good option for athletes and weight conscious people. The calcium content in almond milk is lower than in cow's milk, but is higher in calcium content than soy milk. Nevertheless, packaged almond milk is calcium fortified, so this need not be an issue. Just shake the pack before opening it, as calcium particles tend to settle down. Almond milk is loaded with unsaturated fat, which means almond milk is beneficial in reducing the risk of heart diseases. It helps reduce the bad cholesterol in the blood. Moreover, almond milk does not contain cholesterol and saturated fats. It also contains omega 3 and omega 6 fatty acids. Thus, people with high blood cholesterol and heart disease can consume almond milk without any inhibitions. The protein content in almond milk helps the growth and repair functions of the body. However, almond milk contains lesser protein content in one serving as compared to cow's milk or soy milk. So if you are completely off cow's milk and drinking almond milk on a regular basis, it is important to eat other protein-rich foods, so as to meet the adequate protein requirements of the body. Almond milk does not contain sugar naturally. Packaged almond milk available in stores have added sugar and flavorings which increase the sugar content. However, homemade almond milk contains no sugar and is safe for diabetics. Moreover, since almond milk is lower in carbohydrate content, diabetics can safely enjoy almond milk. Almond milk also furnishes the body with high levels of manganese, selenium and vitamin E. Manganese plays an important role in activating enzymes in the body. Manganese along with phosphorous also plays a role in keeping bones and teeth healthy. Vitamin E, an antioxidant protects the cell membranes by destroying the free radicals that cause damage to them. Selenium on the other hand is good for the functioning of the immune system, for reproduction and for metabolism of the thyroid gland. The magnesium obtained from almond helps break down the food consumed into energy. It also assists the functioning of the parathyroid glands, which are responsible for production of hormones known for good bone health. The potassium present helps maintain normal blood pressure. Almond milk is also a good source of flavonoids. This is because, almond milk is prepared by crushing the almonds with the skin. The skin is rich in flavonoids, which is good for cardiovascular health, thereby providing protection against various heart diseases. Almond milk is also rich in antioxidants, thus, is beneficial in preventing heart diseases and cancers. Almond milk can be prepared as when required. Once prepared it can be stored in an airtight container and stored in the refrigerator for 4-5 days. Moreover, since almond milk has not been cooked, it eliminates the loss of various vitamins and minerals during the cooking process. Almond milk is healthy, flavorful and tasty and a glass of almond milk is a good and healthy choice. Soak almonds in water for minimum six to eight hours. Drain the water, and blend the almond with 4 cups of water, until it reaches a milk like consistency. Strain it to remove almond skin and granules. One can store almond milk in an air-tight jar in the refrigerator for four to five days. If you want it to be sweeter, then blend in a few soaked dates as well. Health benefits of almonds include lowering blood sugar levels and treating constipation. And these benefits can even be obtained by drinking almond milk. Unlike other milk alternatives, the plain almond option contains only 8 grams of carbohydrates per serving. The 7 grams of sugars that make up the carbohydrate content have a limited affect on our blood sugar levels. When we consume simple sugars, our metabolic functions tend to miss the nutrients, storing much of the carbs as fat. Instead, the low amount of sugars in almond milk have a low glycemic nature, meaning our bodies fully digest them and use them as energy. Diabetics benefit from this characteristic as well. Vitamin D also helps improve immunity and cell function. Some studies have shown that Vitamin D helps decrease osteoporosis and even Alzheimer's disease. The magnesium in found in almond milk helps absorb more of the calcium provided by the nutritious beverage. The moderate levels of Vitamin A found in almond milk helps keep our eyes functioning properly. Vitamin A directly influences the eye's ability to adjust to differences in light. Even though almond milk only contains 1 gram of protein per serving, it does contain B Vitamins in the form of riboflavin, plus other muscle regulating nutrients like iron. Each serving of almond milk contains about 4% of our recommended daily intake of iron, which helps muscles absorb and use protein for energy, growth and repair. Iron also regulates certain cell functions like oxygen absorption. Lactose is the sugar found in cow's milk. Many people are lactose intolerant, and consumption of milk causes abdominal discomfort, bloating and diarrhea. As almond milk is extracted from almonds, a nut, hence it's plant derived and lactose free, and can be easily substituted everywhere where one might use cow's milk which makes this one of the most important almond milk benefits. As one can easily extract the milk at home without much effort, and also store it without using preservatives and additives, it would be right to say that consuming almond milk means to consume health, 100 percent! It has already been proved that to increase milk production, cows are being injected with antibiotics and growth hormones, leading to allergic reactions and toxic side effects, some as bad as certain types of cancers. Almonds are protein rich, and full of vitamin E, magnesium, selenium, manganese, zinc, potassium, fiber, iron, phosphorus and calcium. Full of heart healthy flavonoids, almond milk helps lower LDL cholesterol and protect the heart. High levels of vitamin E, ensure powerful antioxidants in the body. Antioxidants inhibit the growth of free radicals that are known to cause cancer. Almond milk contains many vital nutrients, hence unlike other milk, they don't need to be fortified with vitamins and minerals. Low in calories and no cholesterol and saturated fats makes this nut milk beverage very healthy and good for those trying to lose weight. Power packed with nutrients, almond milk health benefits will keep you stay fit and fine. However, a word of caution - almond milk cannot be substituted for breast milk. Although the health benefits of almonds are many, it does not have the necessary adequate nourishment required for infant growth. For lactose intolerant babies, it's best to consult a doctor on what would be best for the child. Nuts like almonds also include goitrogens; this substance is known to suppress thyroid gland functioning by interfering with iodine uptake. The use of bitter almonds has also been cautioned against, as bitter almonds, when blended with water, release cyanide; a poisonous chemical. Buy good quality almonds, to not only extract its milk, but also for the many almond milk benefits. And if you don't want to have it bland, add in some chocolate or vanilla flavor to create an instant yummy healthy drink! Almond milk is considered to be a goitrogenic food, i.e., it contains chemicals that can harm the thyroid when consumed in large amounts. For people whose thyroid function is low, it's best to drink almond milk in moderation. Almond milk is not the best kind of milk for infants. It does not contain the right levels of nutrition for an infant and hence should not be substituted for breast milk or formula. Commercially produced almond milk contains more sugar than cow's milk, which is the most obvious disadvantage. Almond milk is naturally not advisable for people with allergies to nuts.